Mayo is more than just for eating! Strengthen fingernails. Are your nails too brittle? Give them the TLC they deserve by coating them in mayo. It also works great for repairing cuticles! Exfoliate skin. Dry, flaky skin? Substitute mayo for your regular exfoliator, if you dare! You can also use the stuff as a hair conditioner. Remove too-tight rings. Coat the affected area with mayo and get to wiggling! Get rid of lice. Hopefully you won’t ever have to use this one! 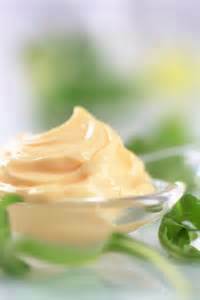 Generously coat your hair with mayo and let it sit for about an hour. Rinse and wash with dish soap. Be sure to check to see if the remedy worked. Soothe sunburns. Next time, wear sunscreen, but this time, coat your painful sunburns with mayo for some much needed relief.